Elegantly carved details give this single sink vanity a look that will be outstanding in the look and feel in the space. This size of this selection makes this piece the perfect choice for a small bathroom or powder room. 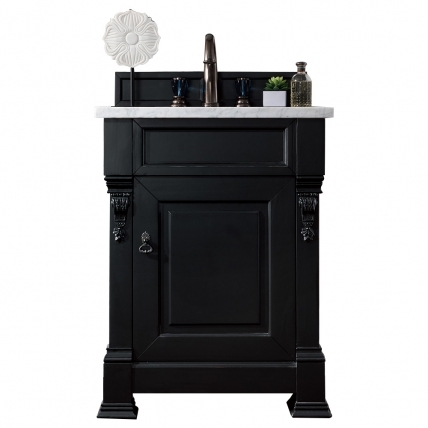 The dark antique black finish makes a bold statement. The style nicely accented by the decorative hardware pulls that are created with an aged brass finish. The single door of the cabinet is installed with soft close hinges and open up to a nice sized storage area that includes an interior shelf that is helpful for organization which is always welcomed in the bathroom.